NORTH ROBINSON — The Colonel Crawford Eagles football team was on their home turf on Friday evening against the visiting Buckeye Central Bucks. Buckeye Central entered the contest still looking for their first victory but Crawford would take the lead early and never look back en route to a 61-6 win. The victory moves the Eagles to 4-3 overall on the season and 2-2 within the Northern-10 Athletic Conference. For the Bucks, they fall to 0-7 overall and 0-4 in conference play. In week eight action, Colonel Crawford will head to Bucyrus (2-5, 1-3) to clash with the Redmen while the Bucks travel to Carey (4-3, 2-2) for a meeting with the Blue Devils. Colton Rowland the Eagles on the board first in the opening quarter, scoring from eight yards out and with the Drew Krassow extra-point conversion, Crawford was off and running; 7-0. Dylan Knisely duplicated the actions of Rowland, also dashing in for an eight-yard rushing score and another Krassow PAT made it 14-0. Rowland and Knisely would score another rushing touchdown apiece in the first 12 minutes, from nine and seven yards, respectively. Krassow converted after the Rowland score but missed after Knisely’s and as the clock reached zeroes in the first, Crawford had a 27-0 lead. To begin the scoring in the second, Rowland scampered in for his third touchdown of the evening, this time from 14 yards out while Krassow’s PAT made it 34-0. The Eagles’ defense scored the next two points for the home team as Brevin Balliett recorded a safety to bring the score to 36-0 in favor of the black and yellow. Rowland would rumble into the endzone for a 42-yard rushing score, his fourth of the night, to put Crawford up 42-0 with plenty of time still remaining in the first half. 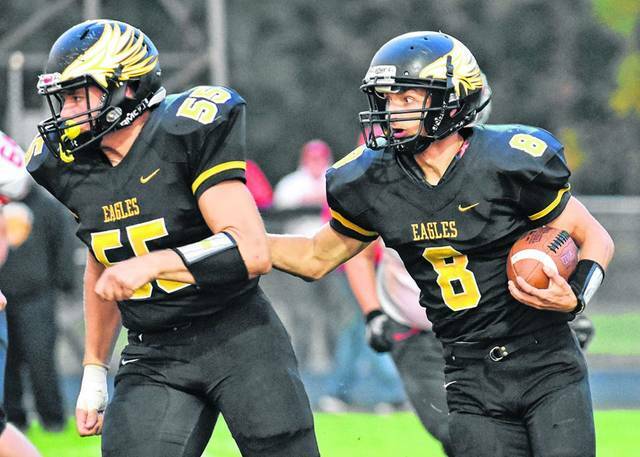 Quarterback Brock Ritzhaupt and wideout Owin Seevers were the next two players to score for the Eagles as Ritzhaupt connected with Seevers for a 52-yard aerial strike to make it 48-0. Before the conclusion of the first half, running back Tristan Cross got in on the scoring onslaught, rushing into the endzone for a 31-yard score and with another Krassow PAT, it was all Eagles at the half; 55-0. Buckeye Central would score the only points of the third quarter as Wyatt Corfman found Jake Heefner through the air for a 36-yard touchdown. The two-point conversion attempt would fail but the Bucks avoided the shutout with the TD; 55-6. In the final quarter of play, the home team would get six additional points as Caleb Lohr dashed in for a six-yard rushing touchdown to bring the contest to its’ eventual final of 61-6. Offensive statistics for the Eagles in the lopsided win were: Team- 444 yards of offense (152 passing, 292 rushing), 16 first downs and 0 turnovers; Ritzhaupt- 7/13 passing, 152 yards, TD, 4 carries, 19 yards; Rowland- 6 carries, 90 yards, 4 TD; Cross- 6 carries, 69 yards, TD; Knisely- 7 carries, 58 yards, 2 TD; Seevers- 3 carries, 34 yards, 4 catches, 106 yards, TD; Jordan Fenner- 2 catches, 46 yards. In the contest, Crawford was penalized nine times for 102 yards. The defense for the Eagles caused five Bucks’ turnovers on the night. Balliett, Jonah Studer and Keton Pfeifer all recorded an interception apiece while Cross and Lohr picked up a fumble recovery each. Also in the N-10 on Friday, Seneca East (6-1, 3-1) downed Carey; 34-27 while Wynford (5-2, 3-1) blew out Upper Sandusky (3-4, 1-3); 51-14. 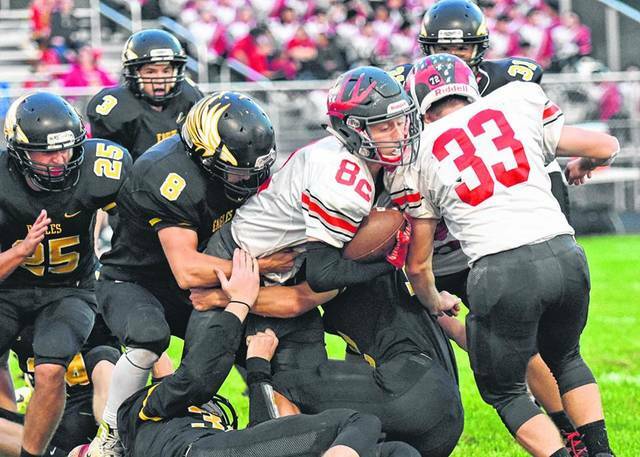 The Mohawk Warriors (7-0, 4-0) remained undefeated after beating Bucyrus; 35-0.